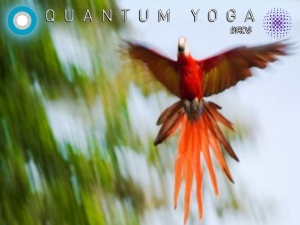 Summer Mondays see Quantum Yoga @ Hub Culture for another season of total immersion Ashtanga! Each week rotates between the themes of Birds, Heroes and Lotus Mandala, the names of Lara Baumann's three CDs. The experience is truly immersive: set in our contemporary space, you are enveloped in 3 video walls projected with exotic birds, mandala and lotus imagery. An original atmosphere, original music composed by some of Ibiza's hottest DJs and expertly trained instruction. BOOK & PURCHASE A CLASS - just follow this link to the store. Monday Classes start at 7:45 PM, but come by a little early and relax in the Hub Pavilion lounge. Healthy energy drinks, bottles water and energy snacks are also available. Limited mats provided, but bring your own of you prefer.